It's true, I do. Ask any of my friends, they will tell you. I have gas, or "gear acquisition syndrome" in a bad way. I can't help it, I just LOVE photography gear in all it's forms. From lenses, cameras, speedlights, bags, gadgets....everything. Now, don't get me wrong, I don't think any certain type or aspect of fresh new gear makes me a better photographer, but I will admit it makes me happy. What I have come to find over the years is that I tend to gravitate toward certain lenses and stick with them for a while. For example, for a LONG time the AF-S NIKKOR 70-200mm f/2.8G ED VR II was my main go to lens for portraiture. I used this lens for almost everything, 90% of any wedding day. It's just a spectacular lens and it fit with what I was doing. Since last year, I have been leaning more towards "prime" lenses. 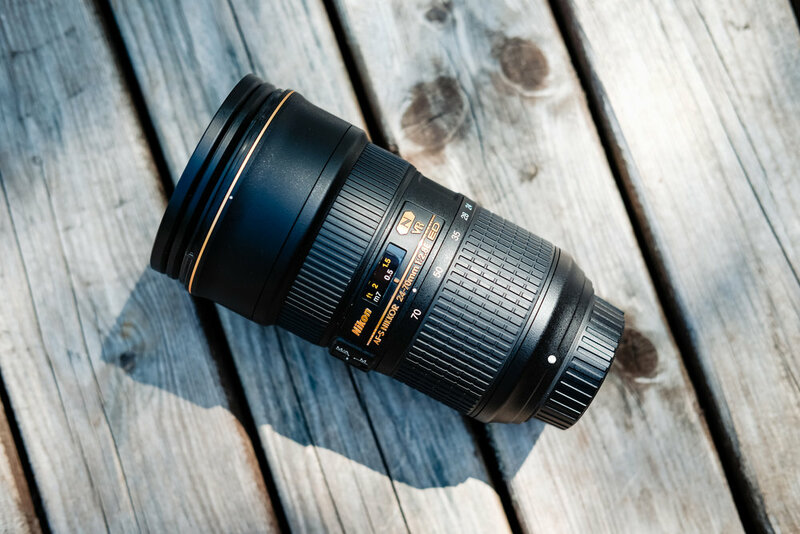 If you don't know what a "prime" lens is, think of if as a lens that doesn't zoom or change focal length. If you want to get closer to your subject, you need to move. I took a look at some of my best images, images that I really liked and just the majority of "keepers" to figure out what focal length I was shooting. A LOT of my images were shot around 28-35mm with the 24-70 lens and 100-135mm with the 70-200 lens. Obviously I used other focal lengths, but these were the big ones and just so happen to fit nicely with some of the best lenses that Nikon makes! Currently, my main lenses are the AF-S NIKKOR 35mm f/1.4G and the magical, spectacular, will be buried with me when I die, AF-S NIKKOR 105mm f/1.4E ED. They are both phenomenal, but the 105mm 1.4 is just in a league of its own! 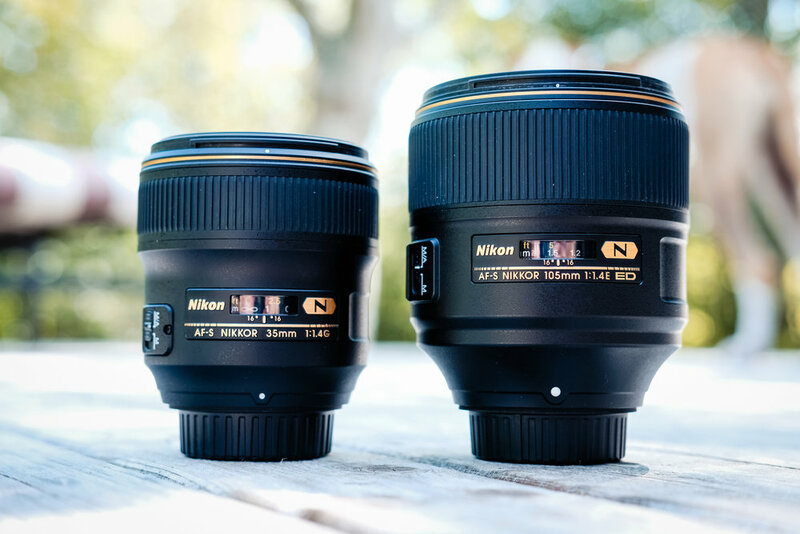 When I say these are my main lenses, I mean they get used the most during a wedding or a portrait session. I typically don't have a plan on what lens to use or what to start with, I just go by how I feel but for the most part and these two are my go-to lenses. I believe that they force me to be more creative as well, force me to think more and keep me on my toes. I have to always be on my toes to make sure what glass is in front of my camera is going to work for the vision that I have for each wedding day or portrait session. These two lenses really fit my approach to my images, they fit me and they produce amazing images. Both of these lenses are super sharp across the full range, you need to be very careful shooting at F1.4 with the 105mm though, you need a nice fast shutter speed. The depth of field at F1.4 is so narrow that it is really easy to miss focus. I don't typically shoot all of my images wide open however, I do shoot at F1.4 a lot, but tend to push it up past F2 a lot more. I don't buy these lenses to drop them to F1.4 and keep them there for everything, there is more that goes into a lens than being able to shoot that wide open, but...it is always nice to have the option to do that! I'm currently taking my time doing a bit of digging on what lens to add for an "in-between" for these two, I am thinking strongly about the AF-S NIKKOR 58mm f/1.4G, but there are just so many mixed reviews, I have been holding back from pulling the trigger. If you have experience with this lens, please send me a message and let's chat! I do have other lenses, one of them being the AF-S NIKKOR 24-70mm f/2.8E ED VR, which to me is more of a safety net. It is a workhorse of a lens that is amazing in its own right, but I just don't tend to use it that often, which is a shame because it is expensive! It stays in my bag along with some others for those situations that I can't control like a super tight church or a room filled with people that makes it hard for me to move around freely, or when I have to be crazy fast with the situation. The zooms have been sitting on the back burner for me for a while, and I honestly believe it will stay that way. I shoot my daily family/life photos with a Fuji XT-2 and the 35mm F2 lens. I do have the 56mm F1.2 but seem to use the 35mm more often. This is always a learning tool, forcing myself to just use one lens daily and making due with what it is. FYI, a 35mm lens on a crop sensor camera equates to about 50mm, and I really like that focal length. I have been having a lot of fun and nailing some amazing quality images with the primes. The 105mm 1.4 is quite possibly the perfect portrait lens. I love getting in close to people for portraits, showing the eyes, the smiles and the emotion, you can see this in a lot of my senior portraits, lots of shots in close. This lens does it better than any other! I am often shocked at just how detailed the images are. 105mm 1.4, excuse the dust! However, in saying all this about the lenses, I just can't leave out my most favourite camera that I have ever used. The Nikon D850! I don't even know how to explain how incredible this camera is. I have never in my life seen files of such incredible quality. I consider myself lucky to even have this body as I know many photographers who are still waiting for their body to arrive! It sports an almost 50 mega pixel sensor and has been compared to Medium Format quality. I was never big on the mega pixel race, I could really care less about how many a camera had. Before I switched to this body I owned the Nikon D4, which if I remember correctly was 16-18mp. But, after owning the D850, I am a believer! The quality and dynamic range in the photographs you can produce with this camera will drop your jaw! Combining these lenses with this camera is a pixel peepers dream come true, honestly. I'm a pixel peeper, I want every single image that I deliver to my clients to be 110% in focus, sharp and perfect with the highest quality possible. With this combo, it just can't get any better. I am not sure where we are going or how the files or quality can get any better, or exactly where we are headed, but if they can make better images than this...we are in for some seriously crazy stuff! I'm very much looking forward to what Nikon will announce this month with their new Mirrorless Line Up...it should be interesting! Anyway, a few more shots of the gear below, if you are a photographer or starting in photography and want to ask some questions, please feel free! I love to chat about gear! The next gear post will be all about what is in my camera bags, what type of bags I currently use, what ones I have used and why I made another switch!